There’s been agreement from all quarters that something needs to be done about nutrition labels. As they are now, they are confusing, with too much information that so few really care about. 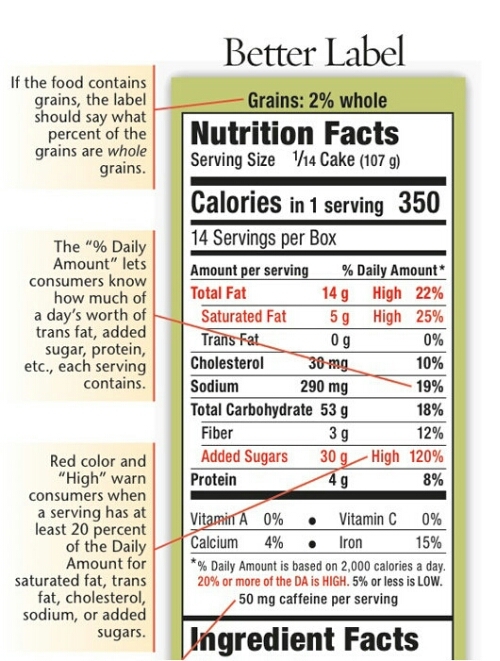 What shoppers and consumers want are easy to understand labels, with calorie, carbohydrate, fat and fiber with a list of true ingredients and chemicals. Right now, so much information is hidden and obsfucated, that consumers just buy whatever and glaze over reading labels. There are as many different label ideas for the new times as there are scientists, dieticians, nutritionists, cooks and so forth. 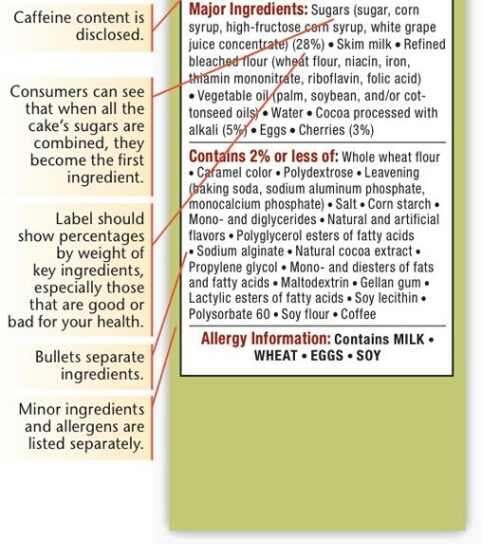 These pictures are from http://www.stumbleupon.com/su/1q2d3a/107B@5dGa:LYfvKvUt/magazine.good.is/articles/redesigning-the-nutrition-label-here-s-one-scientist-s-clever-proposal, and highlight one such idea. Being diabetic, I zero in on carb count: for instance, this cake would be out of my bounds. 53 carbs minus 3 grams of fiber leaves me 50 carbs per serving, as listed, 1/14th of a cake. As you know, they aren’t that huge to begin with. I’m allowed 40 carbs per meal. And it isn’t even healthy. Let’s hope that new labels protect consumers and shoppers. Our health is worth it.